Michael Dubruiel: "Well done good and faithful servant." 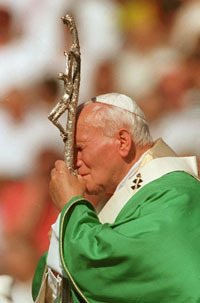 Towards the end, Benedict XVI recalled the last days of John Paul II, sick and in silence. The pope said the Lord “stripped him of everything to assimilate him with himself… His gestures and proclamations were reduced to the bare essential: to the gift of himself to the last”. The pope added: “His death was the fulfillment of a testimony of faith that touched many men of goodwill”. Introducing the Angelus prayer, Benedict stressed that John Paul II died on Saturday, “the day dedicated to Mary”, to who we ask to “make ours that which this great pontiff showed and taught us”.